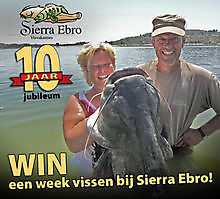 Welcome anglers on our website and thanks for your interest in Sierra Ebro Angling Holidays in the town of Caspe on the river Ebro, Aragon in Spain. 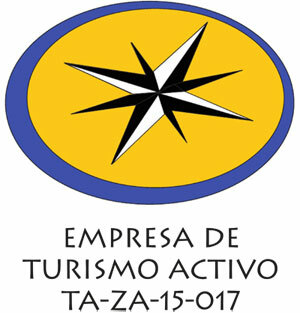 Just over an hour drive from the airports Zaragoza and Reus. We started in March to, to make your angling holiday one to remember. 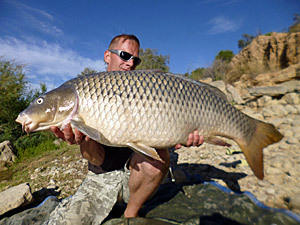 With our knowledge and vast experience we invite you to experience a fantastic angling holiday. We are situated on the banks at the upper lake of the river Ebro, also known as: Mar de Aragon or Embalse de Mequinenza, just a few minutes away from the town of Caspe. 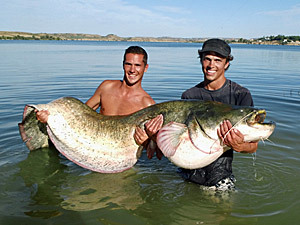 It’s here on the fabulous River Ebro, amidst the beautiful Aragon hills, the place to be for great fishing and to lat your fishing dream come true and catch your very first beautiful cat or aim to achieve your personal best. 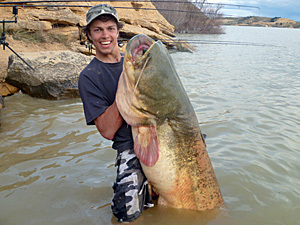 But also the big carp and zander are waiting for you. Sierra Ebro can make this real with or without a guide helping you out, but especially our personal attention will make your fishing holiday an unbelievable success. We are open all year round so you can also enjoy winter fishing for carp and zander. Although the winters can be cold even catching a catfish in January or February from the deeper water is not an exception.